Marjorie Ainsworth is a community cinema hero. She has now been a member of her community cinema, Manchester and Salford Film Society for 80 years! She joined the cinema as a member when she was 16, and has been enjoying films there ever since. Marjorie also won the Roebuck Cup in 2016 at the Film Society of the Year Awards for her commitment to the community cinema movement. 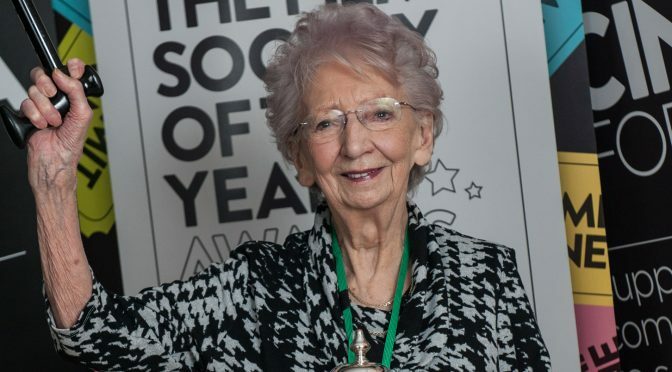 Marjorie has helped Manchester and Salford Film Society through a war, burned out buildings, replaced equipment, presented awards to rising filmmaking talent, hosted meetings in her flat and been a beacon of light and joy throughout. 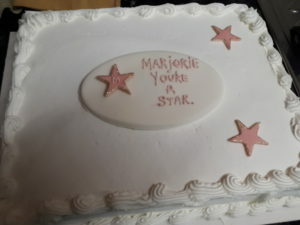 Cinema For All’s CEO, Deborah Parker attended a special event put on by Manchester and Salford Film Society to celebrate Marjorie’s 80th anniversary of being a member. Marjorie continues to be an inspiration to us all and is testament to just how special cinema and the people that fill them can be. From everyone at Cinema For All, we’d like to thank and congratulate Marjorie for all she is and the tremendous dedication she has to community cinema. If you’d like to learn more about the amazing Marjorie, you can listen to our interview with her from our podcast episode last summer about DIY Cinema or watch her interview after winning the Roebuck Cup. She has some fantastic stories to tell and shares a wonderful perspective on being part of a community cinema.